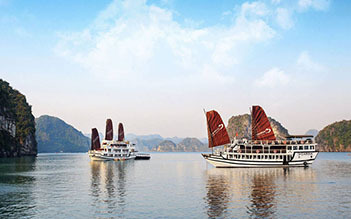 This three-day cruising itinerary to Halong Bay in Vietnam gives you the best chance to enjoy the World Heritage listed Halong Bay from the friendly Carina Cruise boat. Here you can relax on the tanning deck, swim in the clear, aqua blue waters, admire unforgettable scenery only accessible by kayak and enjoy the best cuisine available in the bay. - Our guide and optional shuttle bus will meet you at your hotel in Hanoi Old Quarter. - Get your camera ready to take photos. Comfort break. 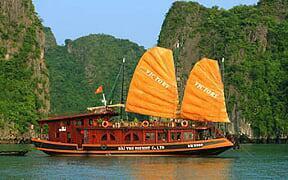 The time from Hanoi to Halong bay is approximately 3 ½ hours. - Arrive at Surprising Cave (Hang Sửng Sốt), explore the cave and find out how the cave was named a Surprising. - For the early risers join us for a Tai Chi session on the sun deck. Tai chi helps focus the mind and condition the body and there is no better environment to practice this than amongst the limestone peaks and islands. - Transfer to smaller boat to exploring Maze Cave, you will have change to visit one of the most beautiful cave in Halong bay and step up to the top of the mountain to get the amazing view of World Heritage. - Mingling yourself in the stunning views of the Bay and it’s dramatic limestone islets as we sail through the calm emerald waters heading to Cửa Vạn floating Village. - Take your option either exploring the village yourself on kayak or comfortably capture the daily life of the fishermen on bamboo boat rowed by the locals. - After dinner, reward yourself with a tasteful cocktail, or take for you one of our onboard activities: book reading, games, movies, squid fishing…. 06:30 For the early risers join us for a Tai Chi session on the sundeck. Tai chi helps focus the mind and condition the body, joining Tai Chi session to full charge your energy for the day. - Take your option either exploring the cave yourself on kayak or comfortably on bamboo boat rowed by the locals. 09:00 Check out the cabins, at your leisure while our cruise taking you pass by other beautiful highlights in the bay. 10:00 You will join with our short class of Cooking demonstration, how to make spring rolls before an early lunch is served. 12:00 Return to the shore and disembark from the cruise as our crew say farewell. 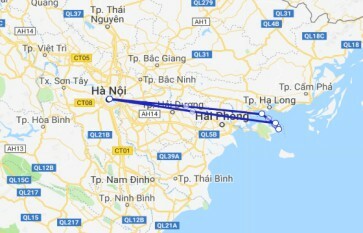 Transfer to minibus or private and return to Hanoi. Went with a fun group of people with the travel company ‘You Can’t Steal My Happy’ I had an amazing time. 3 days/2 nights. Caves, kayaking, karaoke. The rooms were comfortable and the food was delish. Our guide Tom was the absolute best. Calvin Nguyen and the crew of ‘A Class Cruises’ were professional, fun and very helpful. I will DEFINITELY be back and will book with them. ‘A Class Cruises’ is A CLASS ACT! Cruise was amazing and well planned. Never a dull moment aboard the boat - crew was fantastic, very pleasant and helpful. Very accommodating to dietary requirements - we didn’t eat seafood or beef which made up a majority of the menu and the crew took care of this and made a whole new menu for us without a fuss. The meals are incredible - each consisting of 7 courses! Luca was a fantastic tour guide and was very helpful throughout the tour. 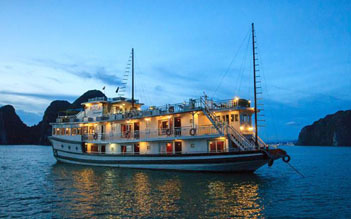 He also informed us of the history of ha long bay. ha long bay itself is breathtaking and definitely a place not to be missed! Was a great size boat that made us feel welcomed. Activities were breathtaking. Will never starv in this boat. We had a kid in our group which was accommodating for him too. Cabins were extremely clean. Happy hour was just as great. Top deck was just as good too. Thank you Peter and the team for looking after us. I loved every minute on the cruise! That was a wonderful stay for me and my sisters, we really enjoyed the trip. Food & drink was excellent. The scenery was over our expectation, thought it was a dream. Staffs were superb, the whole team did a good job, congrats! They are very attentive and helpful. Calvin - Kien - the manager helped us to arrange for our check out early, Tommy - Tien always made sure we enjoyed our meals and had everything we needed, Jimmy - Hung made delicious cocktails with well decorations, another Hung - Taichi teacher was nice too. We enjoyed visiting Titot mountain, Sung Sot cave and kayaking in bay just wish they could last longer but the funniest thing was squid fishing even we didn't catch any of them. Generally, that trip were amazing time for our family reunion, I would like to send a big "Thank" to the team. We would definitely come back!